Once again, the baseball season is about to begin, so time to preview the various teams. For the third straight year here at the mighty THT, I’m looking at the White Sox. Can they build on last season’s 88-74 season or will the franchise continue it’s recent trend of losing records in odd-numbered years? Well, let’s look at some key questions for them this year. Will the real Carlos Quentin please stand up? He’s had quite an up and down career for someone still only 28 years old. He went from well-regarded Arizona prospect to wash out trade-bait. With the White Sox he had a breakout season that put him in contention for the MVP but has since suffered through two disappointing, injury-plagued seasons. Chicago hopes for (but does it expect?) more nice swings from Quentin this year. Will he ever live up to his promise from his glorious 2008 season? Eh…well, it could happen, but he could be one of those guys who had a great season when really young and then never quite matched it. Going by the sabermetric numbers, he had a good offensive season last year but was a dud in the field. His defensive problems were partially due to injuries, but this guy has a nasty habit of getting injured. Last year he set a personal best with 131 games played. 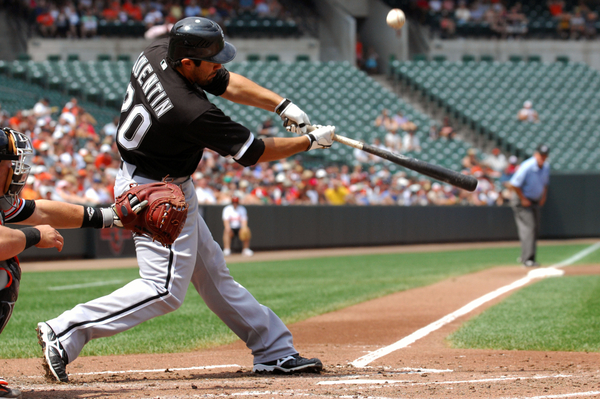 And with Adam Dunn and Paul Konerko on the same roster, Quentin can’t expect many days at DH to help himself out. Quentin remains the biggest wild card in the White Sox lineup. I don’t expect him to repeat his wonderful 2008 season, but he could. I don’t think he’ll crater like he did in 2006 (.236 batting average in 99 games), but he could. He could stay healthy all year, or he could miss most of the season. When in doubt, pick the middle—a good, but not great, hitter with defensive limitations and a stretch or two on the DL. He should help the Sox fill out their batting order, but he shouldn’t be an especially feared guy. 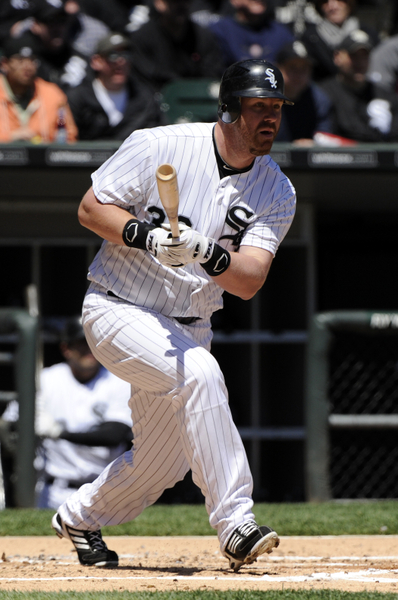 What does the Adam Dunn signing mean for the team? 354 homers and still looking for his first postseason game. This is the big offseason splash for the Sox: signing the former Reds and Nationals slugger to a four-year, $56 million dollar deal to serve as the South Side’s new DH. That’s nice because not only can Dunn really hit, but this team sure could use a DH. First, there’s what Dunn brings to the plate. He’s been an incredibly consistent power hitter, rocking 40, 40, 40, 40, 38, and 38 homers a year in the last six years. He’s in his early 30s now and might slow down, but then again he’s going to a park that is nice for longball boppers. He should be fine. He complements his power game with plenty of walks, though that part of his game dropped off notably last year (just 77 in 2010 after 100-plus each year from 2004-09). He’s a good bet for a .260-ish average with a slugging percentage more than double that and a quality OBP. As for the Sox, last year their DH was Mark Kotsay, who hit .239/.306/.376. Actually, the Sox DH position wasn’t as bad as that indicates. Kotsay had some of his worst games come when spelling first baseman Paul Konerko. The overall DH line from the White Sox amounted to the eighth-best OPS for the position in the AL, though it was an admittedly uninspiring .728. Ultimately, Dunn should be worth three or four more wins to the team with his bat. They need that, because the rest of their offense might regress a bit. 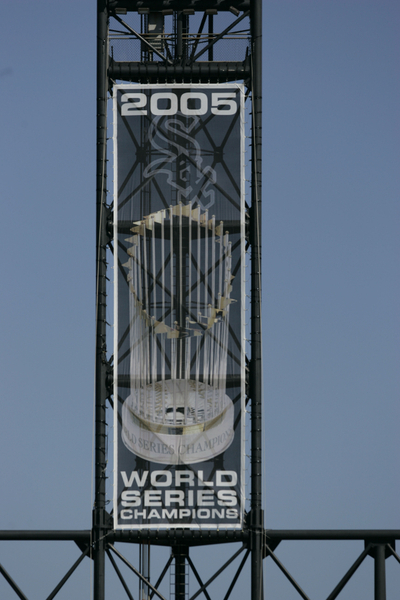 Aside from Dunn, the Sox also made news this offseason by bringing back holdovers from the 2005 World Series team Paul Konerko and A. J. Pierzynski. Both are better bets for 2011 than anyone else on the Sox, but they’re also each in their mid-30s and likely to decline some. That’s especially true of Konerko, who hit an improbably good .312 with 39 homers last year. No one, not even his mother, expects him to repeat that. Some other guys on the offense should improve, most notably infielder Gordon Beckham, who experienced a horrific start to his sophomore season before finding his groove again. That said, given how important Konerko was to the Sox offensive attack last year, they need someone like Dunn to come aboard and prevent a scoring decline. Overall, I can see Chicago’s offense improving a touch due to their substantial improvement at designated hitter. What should be done with Chris Sale? The Sox have a problem with Chris Sale, but fortunately it’s the sort of problem you’d like to have. Sale, the team’s No. 1 pick in the 2010 draft, pitched so well in the minors that the club promoted the 21-year-old to the big leagues in early August. He continued to pitch brilliantly, with a 1.93 ERA in 21 relief appearances. Therein lies the problem. Ideally, the Sox would like Sale to be a starter. Ideally. However, they already have four rotation slots solidly locked down by Mark Buehrle, Gavin Floyd, John Danks, and Edwin Jackson. The fifth slot is held in waiting for the Cy Young Award winner turned perennial injury case Jake Peavy. The Sox have already decided what they’re going to do with Sale: he’s in the bullpen. 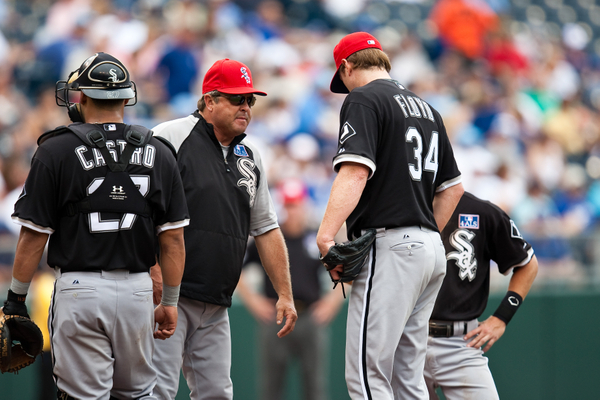 While they think he can be a starter down the road, the South Side brain trust doesn’t want to shuttle him in and out of the rotation, fearing it could mess him up. Instead, they will let him have a set role for his first full MLB season. This strikes me as an eminently sound approach. It’s actually the way Earl Weaver used to break in his starting pitchers: have them acclimate by spending a year in the bullpen. More importantly, it seems like a good fit for the Sox. Right now, Chicago has dependable fifth starter. (If Peavy is healthy, he’s great, but do you really want to depend on Peavy’s health?) A void at the end of the rotation would appear to be a mark against the Sox. Would appear to be. In reality, almost no teams have a solid fifth starter. Practically by definition, that’s a replacement-level starting pitcher. Heck, the Sox probably have an advantage on the league in the fifth hole with Peavy’s remnants. Furthermore, most teams don’t have four good starters. Hell, a lot of teams are looking for a good No. 3. This is where the Sox excel. They already have four dependable arms who can give them a quality season. Their one-through-four starters are as solid as any team in the AL. Sure, Sale would help, but they’re already well ahead of most teams, including competing squads in the AL Central. Furthermore, Sale can, obviously, help shore up their bullpen. With Sale, veteran Matt Thornton and the newly signed Jesse Crain, the Sox should have a very solid core to their bullpen. All the above assumes the pitchers continue to pitch well, always a dangerous assumption. Mark Buehrle is now in his 30s and looked very hittable at times last year. As great as Edwin Jackson pitched after coming to Chicago, can he really keep it coming for a full year? Is Don Cooper the most underrated man in major league baseball? All the above points only make sense if the Sox’s main arms, especially their main starting pitchers, continue to thrive. Normally, that’s a very risky assumption, as pitchers have this nasty tendency to fall down and go “Boom!” The act of pitching is often the act of damaging an arm. Cooper in his element: helping a starting pitcher. That said, I wouldn’t be surprised if the main arms continued to thrive. The Sox have a secret weapon, perhaps the most underrated man in major league baseball: Don Cooper, their pitching coach. Since Cooper took over in mid-2002 as the Sox’s hurler handler, the team has had an impressive record with its pitchers. Esteban Loaiza showed up in Cooper’s first season, and went from nothing to a 21-game winner who led the league in strikeouts. The team flipped Loaiza to the Yankees for Cuban refugee Jose Contreras. The previously underachieving Contreras won 17 straight regular season games with the Sox. Jon Garland emerged as a dependable workhorse early in Cooper’s tenure, and later on, both Danks and Floyd developed. And, yes, just last year Jackson immediately improved his control upon arriving in Chicago and not-so-coincidentally became a much more effective pitcher. Perhaps what’s most impressive about the Sox under Cooper is the health of their starters. 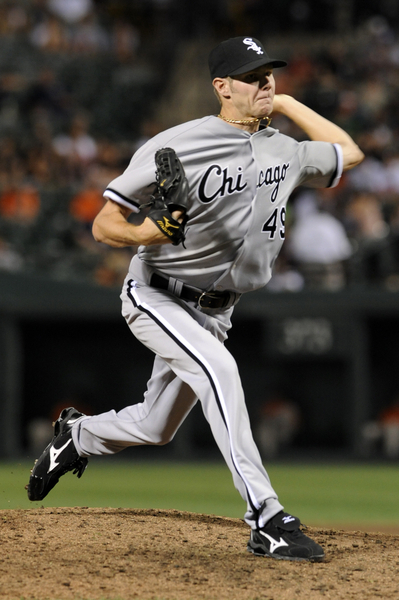 From 2002-10, the Sox have coaxed 30 starts in a season from one of their pitchers 32 times. For perspective, here’s how the Sox compare to the other leading MLB teams in this category in the Cooper Era. Damn. That ain’t even close. The Sox are a standard deviation unto themselves. It takes more than just a pitching coach to produce results like that. It tells you the front office prioritizes dependability in picking starters. It tells you their farm system takes care of guys. It tells you the pitchers are durable. No, you can’t give Cooper all the credit, but you sure as hell can’t ignore his contribution. As the pitching coach for the MLB team, he’s point man in ensuring the starters remain healthy and effective. He’s done an excellent job of that. Cooper doesn’t wave a magic wand and suddenly make people better. (Buehrle may very well be a back-of-the-rotation guy if his strikeouts keep sinking, and that drop could easily happen this year.) But Cooper is mighty nice pitcher insurance to have on the team. Cooper has never gotten the attention of say, Dave Duncan or Leo Mazzone, at least not yet anyway. If Cooper isn’t the most underrated man in MLB, it may be his counterpart in Minnesota, Rick Anderson. Both men are part of the reason why their teams often seem to exceed their projections. Can they win the division? The goal: another one of these. This is my third straight year doing the five questions thing on White Sox at THT, and I’ve never been as bullish on the team as I am in 2011. Their offensive should be a bit better with Adam Dunn. A full year of Edwin Jackson improves their rotation. The bullpen looks better with Sale and Crain. The overall roster has improved, and this was a team that won 88 games and finished second last year. The Sox should leapfrog them and finish first. Last year I said the Sox’s chances depended on Peavy and Quentin, as they needed at least one to return to form to win the division. This year, if Peavy remains injured and Quentin plays about as well as he has the last two years, I still think the Sox win the division. This looks like the team to beat in the AL Central this year. I don’t know who served me the South Side Kool-Aid this spring, but it sure does taste good. I’d be more bullish on the Hose if they were competing only against the Twins. Unfortunately, there’s also the Tigers to contend with. This could be another win-90-and-finish-third type of year for someone (like the Sox in ‘06). Good analysis. I’m like you, this is as excited as I’ve been about a Sox tema since 2006. I think the defense shouls be alittl better too. Morel is an upgrade over Vizquel and Bekham has a full year at second under his belt. Hopefully, Ramirez won’t regress. The only real defensive liabilities are Konerko’s range, Pierre’s arm and Quentin. All the others are adequate or better.